The family will receive friends from 5:00 p.m. – 7:00 p.m. on Friday, March 15, 2019 at Hohner Funeral Home. Funeral Services will be held at 11:00 a.m. on Saturday, March 16, 2019 at Trinity Lutheran Church, 504 S. Westnedge Ave, Kalamazoo, MI 49007 with Pastor Ken Johnson officiating. Interment will be held at Ft. Custer National Cemetery at a later date. 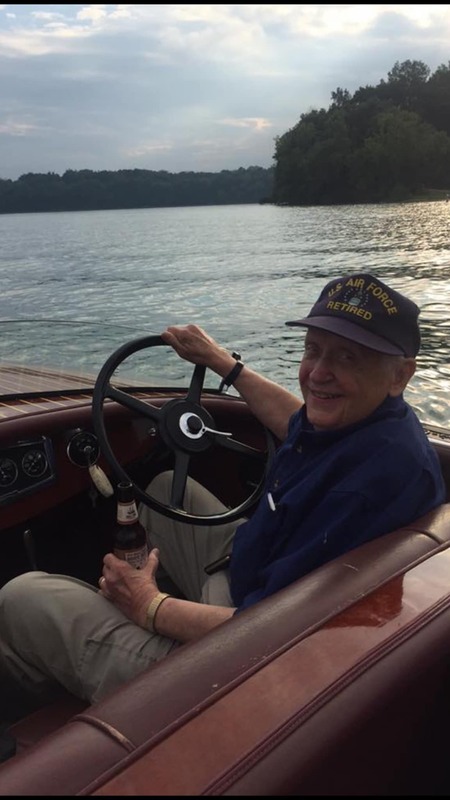 William H. Johnson, Three Rivers, passed away peacefully at his home on Corey Lake on Saturday, March 9, 2019. Bill was born on December 12, 1928, in Elkhart, Indiana, to Lorene and Herbert Johnson. He grew up in Elkhart, along with his beloved sister, Marilyn Claire (Teller), who preceded him in death in 2013. He attended Elkhart High School before Augustana College. He graduated from Augustana in 1951, the same year he joined the United States Air Force, and subsequently the Indiana National Guard. He attended medical school at Indiana University, where he graduated in 1958. He did his residency in internal medicine at Indiana University Medical Center, until he was recalled to active duty in the USAF during the Berlin Crisis. He met the love of his life, Ann Marie (Bacon) while both were serving in medical roles in the Air Force. He saw her walk into the Officers’ Club, turned to his friend and announced that was the woman he was going to marry. He was right – in October 1963, Bill and Ann were married at Bunker Hill Air Force Base. He continued to serve in the Air Force and Air Guard until 1988, when he retired with the rank of Brigadier General. His many awards and recognitions include the Legion of Merit from the Secretary of the Air Force, Air National Guard Meritorious Service Award, and the Presidential Citation – Aerospace Medical Association Honors. He was a charter member of the American College of Emergency Physicians beginning at 1969. He was a member of a group of physicians who formed the first emergency medical departments at several Michigan and Indiana Hospitals. During his many years practicing medicine, he served as chair of the Trauma and Emergency Center at Bronson Methodist Hospital, and as Medical Director of the Emergency Departments at Elkhart General Hospital and Goshen General Hospital. He later co-owned Dunlap Urgent Care Center in Goshen, Syracuse Urgent Care Center in Syracuse, and I-Med Clinic in Three Rivers. Bill was an avid pilot, flying both military aircraft and private planes, and served as a flight surgeon throughout his Air Force career. He was a member of the Kalamazoo Hangar of the Quiet Birdmen, a pilots’ association. This membership brought him laughter, joy, thoughtful conversation, and good friendships, particularly during the last year. Bill will be remembered for the devious twinkle in his eye, his ready laugh, his generosity to everyone around him, and his great love of books. With the assistance of Hospice Care of Southwest Michigan, he was able to spend his last two weeks at home with family and friends. He loved nothing more than looking out at Corey Lake and spending time with his family. Anyone who knew him knew that his greatest blessing in life was his wife, Ann, and he spent every day of their 55 years together letting her know how much she was loved. His last few days were spent in his favorite place with his favorite people, and plenty of laughter. Bill is survived by loving wife, Ann; his son Ernest Michael Johnson of Three Rivers, his daughter Jennifer (Robert) Kehoe, of Sun Prairie, Wisconsin, grandchildren Cody Michael Johnson, Joseph Theodore Kehoe, and George William Kehoe, nephew Mark (Paula) Teller of Wallingford, Pennsylvania, and niece Nancy Faine of Glen Ellyn, Illinois. Donations in his memory may be made to the Leukemia and Lymphoma Society or to the St. Joseph County Dive Team. Envelopes available at the funeral home. It is hard for me to put into words how much love, respect and admiration I had for my good friend, Doc Johnson. I served with him as a radiology tech in the 122nd TAC Hospital of the Air National Guard and also in Chambley, France. We would keep in touch at ANG reunions and by e-mail and in later years a group of us from Fort Wayne would meet him every year around Veterans Day at Lucchese’s Restaurant in Elkhart for lunch. That was always a great day and we will all miss doing that. My condolences to his wife Ann and children Ernie and Jennifer and family. Please receive the sympathy and condolences from all of Bill’s relatives in Sweden. He was always a true friend and a most welcome visitor whenever he and Ann travelled to our side of the Atlantic Ocean. The bonds he forged with his Swedish next-cousin Alice, my mother, during her years in Elkhart in the early fifties, remained strong through all those years. When Bill was stationed in Europe in the sixties, he came to stay with us every summer, visits that we still have fond memories of. Our warmest thoughts go to Ann, Jennifer and Ernie and their families. He was always so good to my husband, Ron, who is disabled. He often picked Ron up so they could go to aviation-themed meetings and dinners together. His kind smile and beautiful spirit will be missed. We appreciated him so much…may you all find peace and joy in remembering this remarkable man. My thoughts and prayers go out to the family as I remember Bill as a young intern when I was. We were in General Practice of medicine one year in Gary Ind. Bill was ‘best man’ at our wedding. I remember Bill fondly as a good friend, a hard working, caring, trustworthy and honest young physician. We are so sorry to hear about Bill’s passing. We will always remember and cherish the times we met, both at your wonderful house in Corey Lake, as well as your visits to us in Sweden. Our sincere condolences go to Ann, Ernie and Jennifer with families.